The old school clock maker heads into the future. In the early 2000s Swiss watchmaking smartly evolved to stay relevant, creating watches that looked anything but traditional. Clockmaking, on the other hand, has mostly stayed in the past. Many of the clocks Swiss clockmaker L’Epée 1839 makes today are identical to the carriage clocks it made in the 19th century. But its collaborations with MB&F, starting in 2014 with the Starfleet Machine, encouraged the clockmaker to get with the times. L’Epée 1839 has since continued with tie-ups with the likes of watch designer Fiona Kruger, hifi system builder Kostas Metaxas, and the eminent French crystal firm Baccarat. The injection of creativity from these partnerships invigorated the firm, helping to reel in a new audience. At Baselworld this year L’Epée 1839 not only unveiled the lavish clock it built for Chanel, but also its very own creation, the Time Machine. 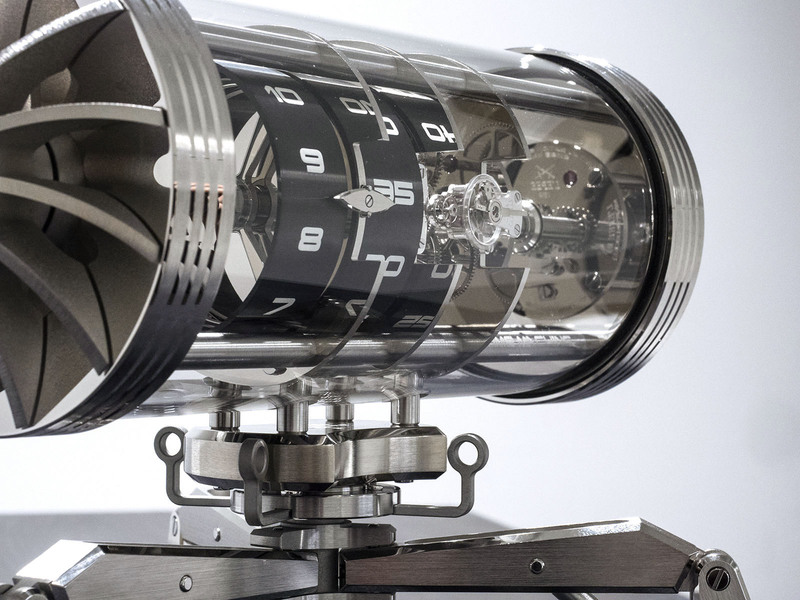 It’d be fair to say that a large, spaceship-sized degree of MB&F’s design sensibilities has rubbed off on L’Epée 1839. 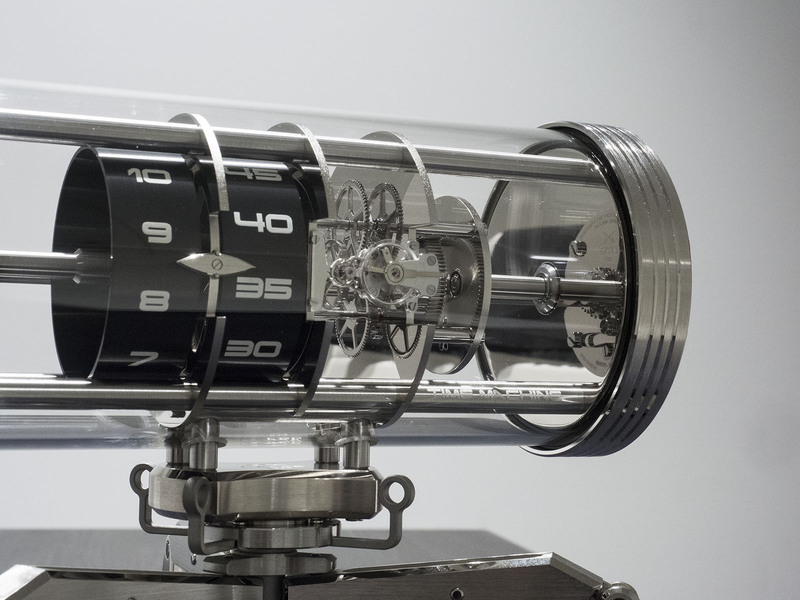 Conceived by in-house designer Martin Bolo, the Time Machine was inspired by American science fiction film of the same name. 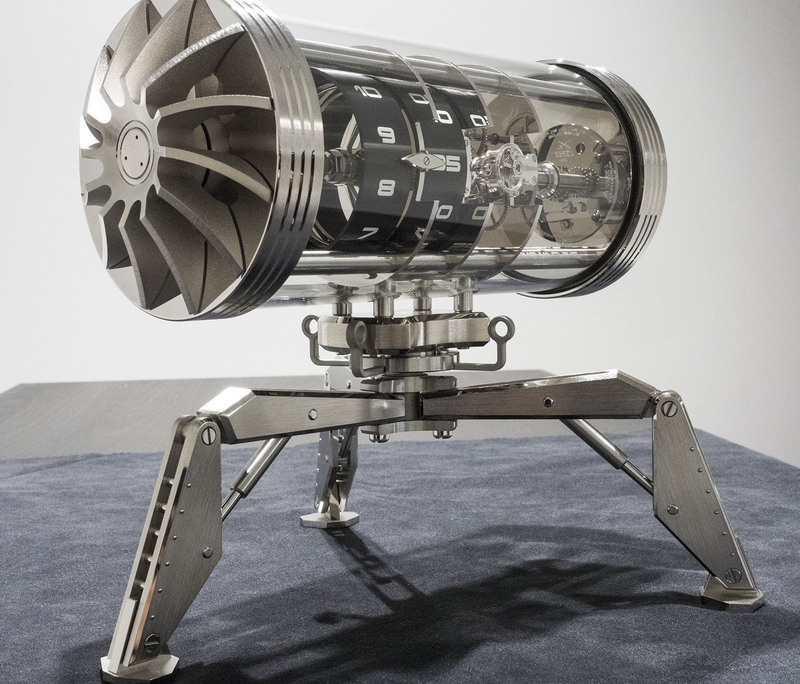 Measuring 25.7cm in width and 22cm tall, the Time Machine houses the eight-day cal. 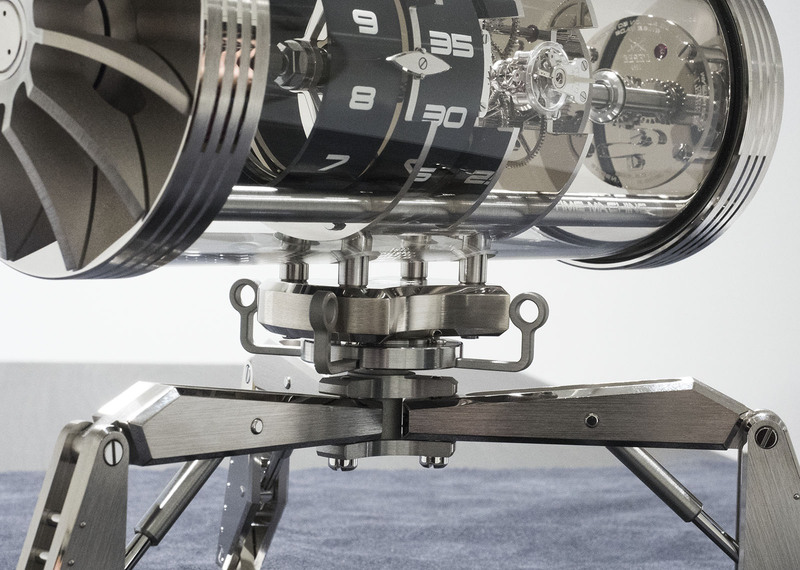 1855 with a vertical escapement – the same movement used in the MB&F Destination Moon clock. It displays the hour and minutes on two rotating drums inside a swivelling glass cylinder that can be locked in position with a wing-nut. 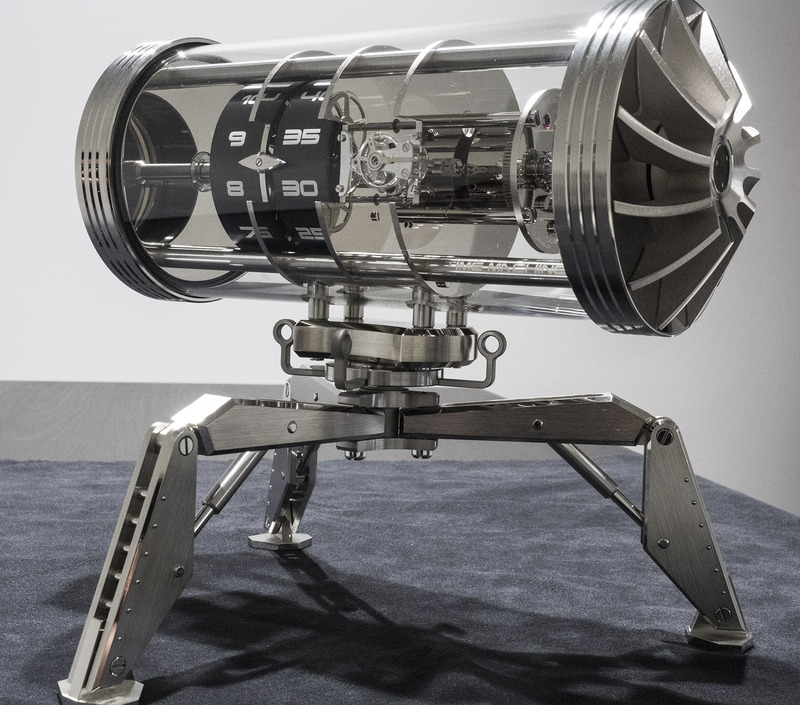 It is composed of brass and stainless steel, and stands on tripod legs, inspired by the temporal convector of the DeLorean sports car. 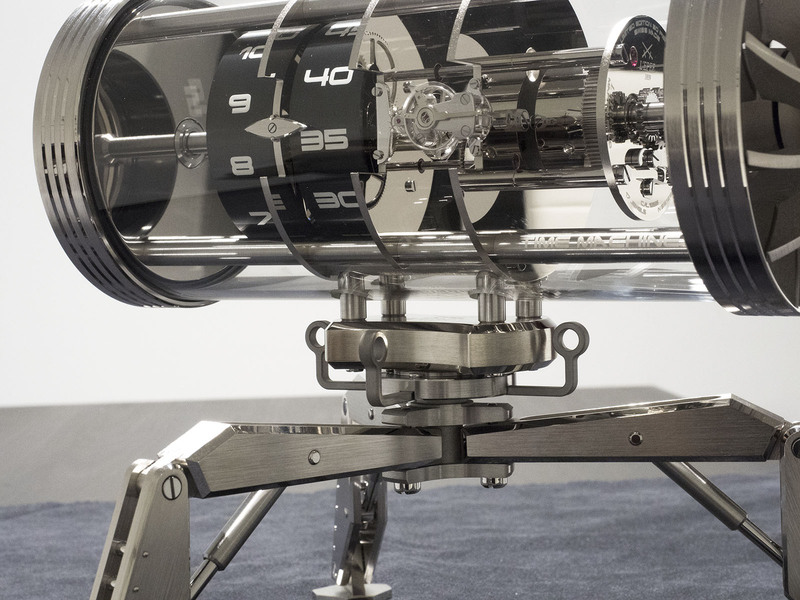 The glass cylinder is bookended by two propellers, which are actually giant crowns: the left sets the time, while the right winds the barrel. Each version of the L’Epée 1839 Time Machine is a 50-piece limited edition and priced at SFr29,900.